Jorge Masvidal lit a fire under his teammate Yoel Romero. 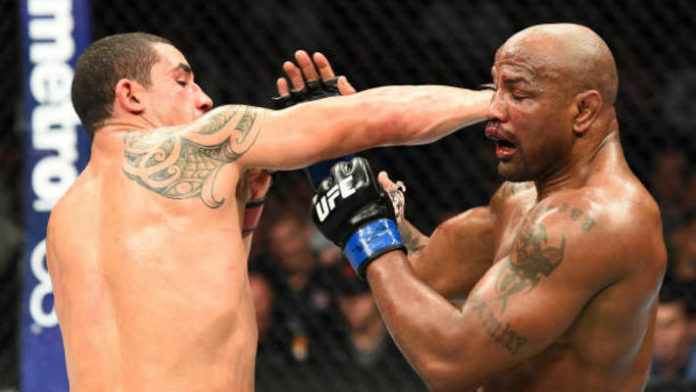 Earlier this month at UFC 225, Romero took on middleweight champion Robert Whittaker. The bout served as the pay-per-view headliner, but it wasn’t contested for the 185-pound gold. That’s because “The Soldier of God” missed weight. Romero and Whittaker went the distance. Despite having success in the bout and almost finishing “The Reaper” in the final frame, Romero ended up falling short via split decision. It was a tough break for Romero, but he almost never even had the chance to explode in the fifth round. Romero and his team plan on suing the Illinois Athletic Commission for not allowing him two hours on his second weight cutting attempt. Romero came in heavy at 186 pounds on his first attempt. Fighters are allowed two hours to cut on their second attempt, but the commission stopped Romero after just one hour. He ended up tipping the scales at 185.2 pounds. UFC president Dana White revealed before the UFC 225 bout that he’d like to see Romero take on light heavyweight Alexander Gustafsson if he emerged victorious. Do you think Jorge Masvidal used the towel simply to motivate Yoel Romero?